It's early in the morning, you HAVE to get out of bed and get moving, but you just are not a coffee person. Wouldn't it be nice if a refreshing cup of hot tea had as much caffeine as a typical cup of coffee? Is that possible? With Zest Tea, IT IS!!! When founders, Rickey and James, went looking for a highly caffeinated tea, they came up empty handed. Rather than calling it quits, they grabbed a mug and went to the drawing board! The self-professed "tea-heads" knew how to brew a good cup of tea, they just had to infuse them with caffeine. After some crowdfunding, they launched their first product in January of 2014. This year at Expo East I stumbled upon Zest Tea and was immediately intrigued. Tea with as much caffeine as a cup of coffee? I had never heard of such a thing, but y'all, this stuff is amazing! If you have followed my blog for a while, then you know a favorite drink of mine when I am not feeling so well is Sick Tea. The idea struck me, why don't I try a version of it, but now with Zest Tea. About ten minutes later, I was feeling "Zesty" and went on a tear, cleaning the house from the floor to the ceiling. This stuff really works! My flavor of choice? Cinnamon Apple Black! According to their website, "​We looked to American icons when creating this blend and what’s more American than Apple Pie? Unfortunately, football and the Grand Canyon didn’t make for great teas. This blend of premium Orange Pekoe black tea smothered in real bits of apple and cinnamon is a nod to your grandmother’s 4th of July specialty." They got this American Icon right! Whether you're a self-proclaimed "tea-head", or want an alternative to your morning cup of joe, with the help of Zest Tea, where there's a meal (or tea), there's a way! Where can I purchase this interesting product? Hey there Julio! 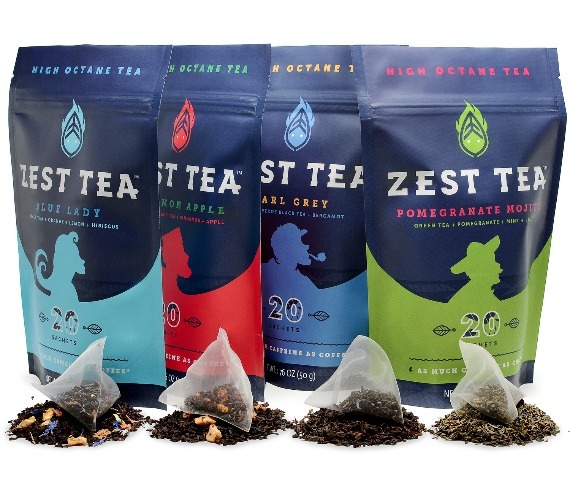 You can purchase straight from Zest Tea's website or from Amazon! Thanks for the love Keleigh!!! !